Why decide between a mojito and a margarita when you can have both? 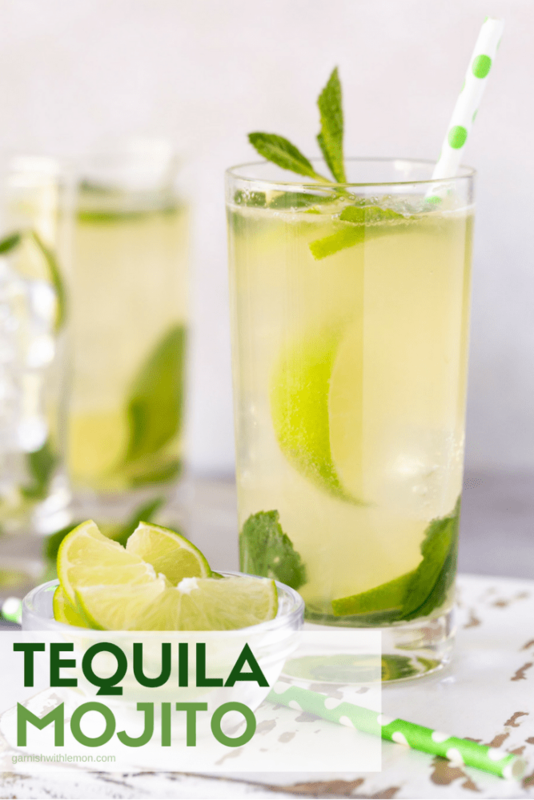 Two of my favorite drinks are mixed together in this Tequila Mojito cocktail recipe. You can never have too many great summer drinks, and this Tequila Mojito combines a couple of my favorite flavors in one tasty cocktail. 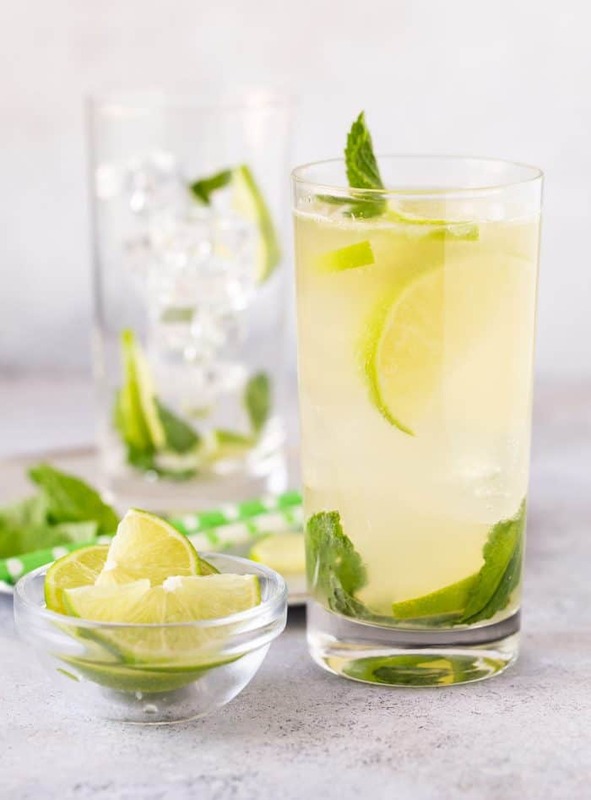 It’s the best of the mojito and margarita worlds, a cocktail so light and refreshing that this Tequila Mojito has been officially named our house cocktail for summer entertaining. What is a Tequila Mojito? To make this Tequila Mojito, I used the tequila from the margarita and combined it with the mint from the mojito. But I didn’t stop there. I infused the simple syrup with mint rather than muddling it like you do in a traditional mojito, thus making this Tequila Mojito the PERFECT batch cocktail. It’s easy to make and a critical component of this Tequila Mojito recipe. Simply combine equal parts sugar and water in a pan and heat over medium heat until all sugar is dissolved. Remove from the heat and add a generous amount of fresh mint leaves and let it cool. The mint flavor will be released in the syrup. Let the mint leaves hang out in the syrup for a couple of hours if time allows and then remove them and store the mint simple syrup until you are ready to use it. And the hardest part of the cocktail is done. Easy peasy. The recipe below makes one serving, so simply count the number of people on your guest list and do a little math to figure out the quantity of each ingredient. 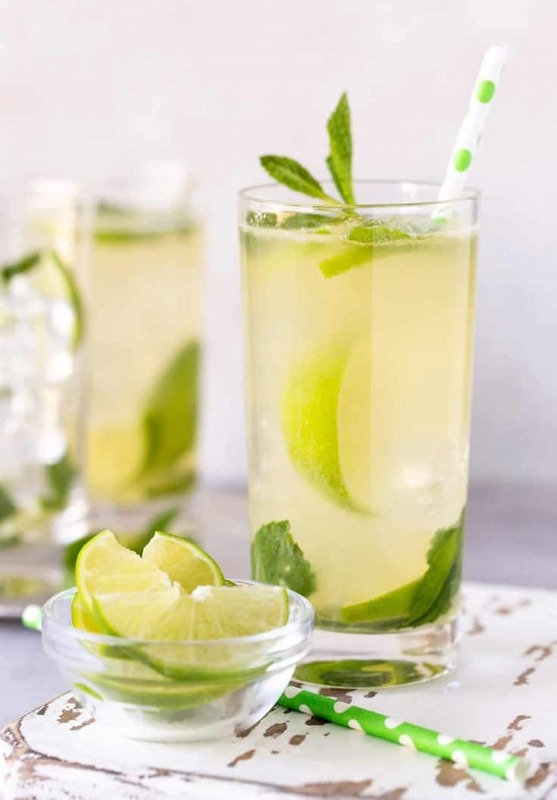 For example, if you are serving drinks for 8 people, use 24 ounces of tequila, 16 ounces of freshly squeezed lime juice and 16 ounces of mint-infused simple syrup. Pour it all in a pitcher and refrigerate until needed. Wait to add the club soda until serving and you can even let your guest do that themselves. A batch of these Tequila Mojitos makes summer entertaining fast and easy. Who’s coming over? Fill a shaker with ice and add tequila, simple syrup and lime juice. Shake to mix and add to highball glass filled with ice. Top with a splash of club soda. Combine the water and sugar in a small pan on the stove. Simmer over medium heat until sugar is completely dissolved. Remove from heat and add mint leaves. Let sit until simple syrup is completely cooled. Remove mint leaves from syrup. Refrigerate until ready to use. I am very intrigued! we are currently all about margaritas right now – fresh and simple and different each time – I will be adding this recipe to the mix soon! Absolutely loving this beautiful and I KNOW delicious recipe! I can see why it was named the summer cocktail of 2015! Love that you infused the mint, I am so trying that next time! My husband and I love mojitos so this recipe is totally happening at our house soon! Miss you girls! This is my kind of drink! I could definitely sip on this for Cinco de Mayo! Great drink. Perfect for summer. Sounds amazing! I would love it if you would link this up to Tipsy Tuesday at Grey is the New Black. This drink sounds yummy! But where did you get those cute glasses? Love them! Thanks, Jill! I got the glasses at Target, they are acrylic 🙂 Perfect for outside sipping! Hope you are well!